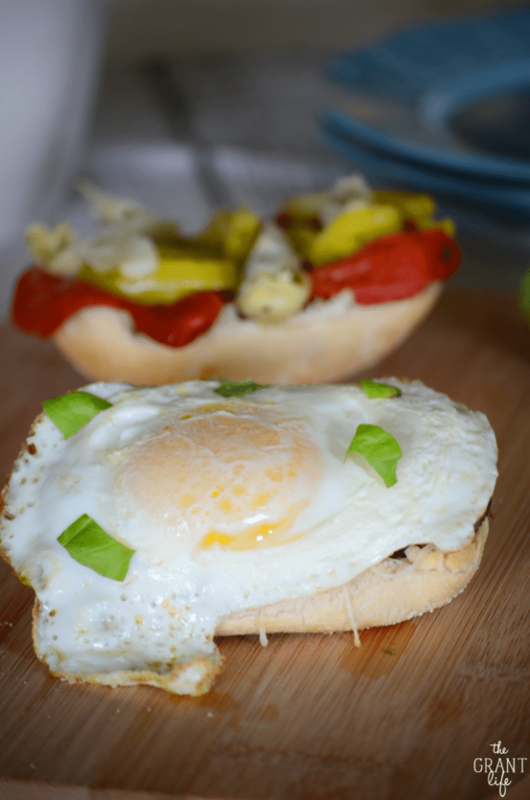 This Italian breakfast sandwich is full of flavor and easy to toss together! The Grants are officially back from vacation! We spent a little over a week up in Michigan hanging with family and friends. The weather was perfect, the kids had their cousins, my in-laws live like 3 miles from the outlet mall. It was a pretty fun week for all. On Monday we loaded up the car and started our drive back to Texas. Yes, we drove. From Texas to Michigan and back again. With two kids who fought most of the drive. [Both ways]. Oh and one of our dogs. But it really wasn’t too bad. The kids had their Nabis and coloring books and toys that kept them entertained. And we figured out that we can watch Netflix on my iPad with mobile hotspot. So we had movies too. And the dog [Jaxon] was really good. She just hunkers down and sleeps until we make a stop. She was actually the most well behaved on the trip. Me? I like to sleep. I could have probably slept the entire 1600 miles while Ryon drove, but I didn’t. I kept him company and did some of the driving myself. Oh and I watched HIMYM on Netflix. Yeaaaa. I did that most of the time if I’m being honest. The one thing I HATE about these drives though is the food. We always end up eating at some greasy fast food joint for lunch and dinner. We’ve tried bringing food and snacks and good things to eat, but we still have to stop for gas and bathroom breaks. So we normally end up eating the crap food anyways. When we get home I crave real food. 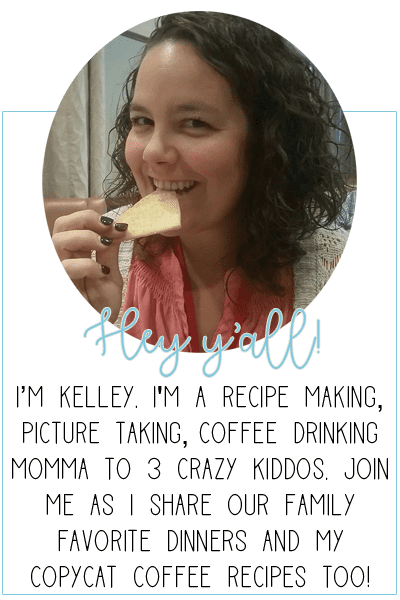 I want delicious homemade comfort food. And fruits and veggies. My body wants the good stuff. On Wednesday morning I woke up and made this Italian breakfast sandwich. 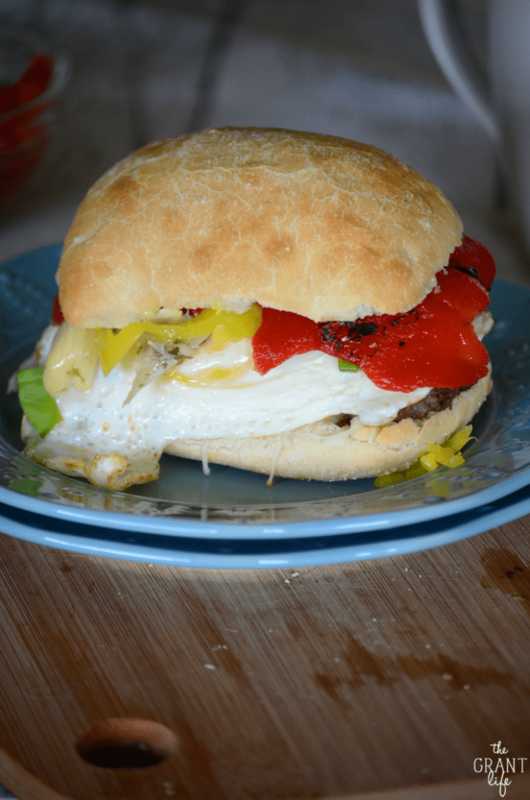 I grabbed a jar of Mezzetta bell peppers from the cabinet, some artichokes, banana peppers and mozzarella cheese. I grilled up some Italian breakfast sausage, an egg and put it all on a ciabatta bun. Oh my yall. It’s exactly what I needed after being in a car for two days. 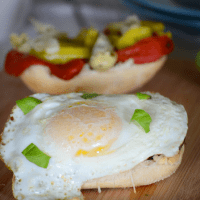 Full of veggies with a drippy egg on top. 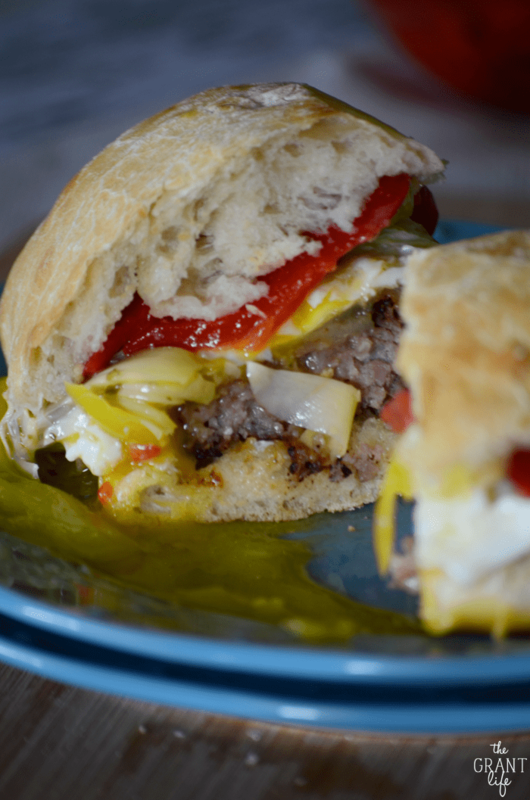 Gah, after eating fast food for days it was nice to cozy up with this delicious Italian breakfast sandwich. And watch How I met your Mother on a real TV. But that’s a different story. Cook the sausage patty until browned on both sides. 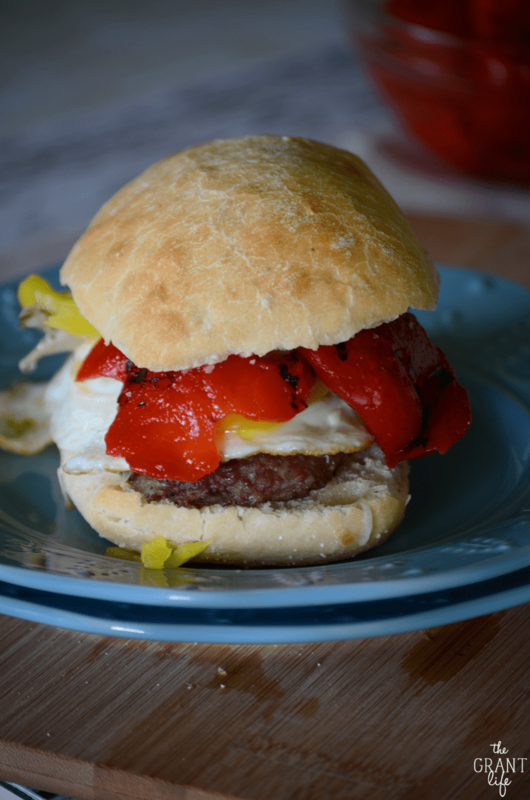 Place the patty on the roll, top with cheese and the cooked egg. Layer on the peppers and artichokes. Place top on the roll and enjoy! This looks sooo delicious… Thanks for sharing!